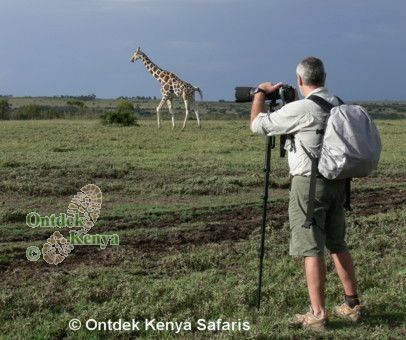 Enjoy Kenya walking vacations where your walking pace will be checked by sightings of Giraffes, Zebras, Gazelles, Colobus Monkeys and colorful birds? Go directly to the walking tours itineraries. Would you prefer to spend your African safari trip walking in areas that are not visited by mass tourism rather than being cooped up in vehicle in the high tourism-circuit? Do you long for genuine one-on-one contact with competent naturalist guides who would take your safari experience beyond the "Big Five"? Read more on how we organize our guided safaris. You want a fully supported walking vacation, staying in comfortable lodges and tented camps rather than in do-it-yourself rough camping? Read more on Africa walking safaris before you book your tour. If you are a nature traveler - we know your answer is YES and as the above queries are the themes around which we have designed and delivered walking vacations in Kenya since 1996, we invite you to choose to travel with us. We have several Africa hiking trips covering the Rift Valley, Aberdares, Amboseli and Masai Mara - there is a choice for everyone! All walking distances are flexible and we provide several guides to accommodate different abilities. What should you expect from your fellow nature travelers? Our clients have a very strong interest in nature be it birding (see our pictures of birds), walking, wildlife and/or nature photography. So you will not find yourself trapped in a safari group that just wants to chase the "Big Five". Be sure to read our tips on Kenya walking tours. Enjoy a guided walking and safari trip in Kenya's Great Rift Valley away from mass tourism. This small group hiking trip covers the nature reserves of Crater Lake and Crescent Island, Hell’s Gate National Park and Lake Elementaita with guaranteed interruptions from giraffes, waterbucks, elands, zebras and various gazelles. Visit Lake Nakuru National Park, which is colored pink with thousands of flamingos, and the open grasslands are home to white rhinos and the Rothschild’s giraffes. The black rhinos are found in the forests around the lake. A safari trip in Masai Mara, the Africa that everyone dreams of, takes the last 3 days of the tour with elephants, lions, leopards, cheetahs, topis and hippos all calling for our attention. A walk guided by Masai Morans makes this a perfect tour in all senses. We handle all tour logistics leaving you free enjoy your safari. See detailed itinerary. A quality Kenya walking vacation with lots of game, reduced road transfers, good accommodation (no camping) in areas not visited by mass tourism. Lake Elementaita is the starting point of this African nature travel that shows a variety of landscapes found in the Rift Valley. We stay for 2 nights at the Sunbird Lodge. Lake Nakuru is colored pink with thousands of flamingos and Lake Naivasha has a huge population of hippos. Walk in the savannas in Hell’s Gate, Crater Lake and Crescent Island that are home to plains game such as baboons, giraffes, elands, zebras, various gazelles and warthogs. We handle all tour logistics leaving you free to enjoy your Kenya walking tour. See detailed itinerary. 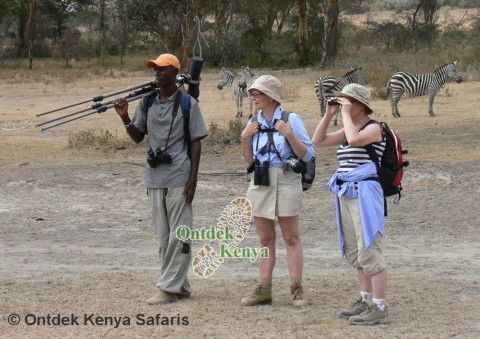 Join Ontdek Kenya walking tours from mass tourism. Start with walks in the indigenous forests of the game rich Aberdare sanctuary and the Solio ranch. Do a unique African safari in the Solio game reserve, which has the high population of black rhinos. Spend a night of wildlife viewing from one of the platforms at Treetops - a tree hotel in the Aberdares. The tour then progresses to scenic places in the Great Rift Valley for more game viewing and walks in Crescent Island, Crater Lake, Hell's Gate and Elementaita with guaranteed interruptions from Giraffes, Waterbucks, Elands, Zebras and various Gazelles. Masai Mara, the highlight of safari trip in Africa, takes the last 3 days of the tour with Elephants, Lions, Leopards, Cheetahs, Topis and Hippos all calling for our attention. A walk guided by Masai Morans is among the many highlights in this African adventure. We use quality lodge or tented camp accommodation throughout the tour (no camping), making this a perfect walking vacation for hikers of all ages. 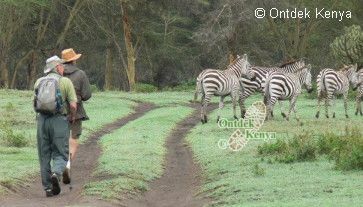 This relaxed Kenya walking tour starts from our home base i.e. the Aberdares/Mt.Kenya region, where over the years we have introduced & guided our clients to the hidden gems in this area: the open savannas of Aberdares game sanctuary and Sangare Ranch teaming up with giraffes, zebras, impalas, Thompson’s and Grant’s gazelles all yours to discover as you take guided walks in absence from mass tourism. Solio ranch – which has a high concentration of Black Rhinos is a must visit in this area. Going to the tree hotel will add to the many highlights that you have already enjoyed in this guided walking trip. 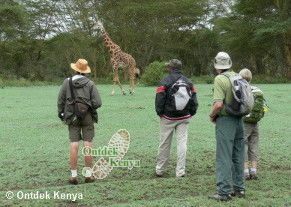 The guided hiking tour ends with 3 days in the game rich private sanctuaries in Lake Naivasha area. See detailed itinerary. This is a relaxed 9 days hiking tour that visits popular private game conservancies in the Rift Valley and the Swara Plains - highlight here is the huge numbers of oryx, elands and other plains game. A safari in Amboseli with the snow-capped Kilimanjaro takes 3 days giving us enough time to see huge herds of elephants, rhinos, buffaloes, cats and plains game. Should you be a bird watcher (see our birds pictures) or a wildlife photographer this walking holiday is ideal for you as there is time per location enabling you to indulge in your hobby. What's more with our competent naturalist guide who will accompany you throughout the tour, we guarantee you an all round nature safari. 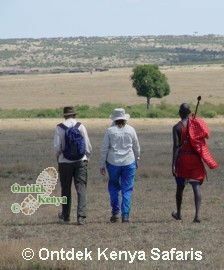 For a consultation on Africa walking safaris, contact Ontdek Kenya safaris, we have been organizing walking holidays in Kenya since 1996.